I first discovered steel-cut oats a few years ago when Dan and I spent a weekend away at the Salish Lodge in Snoqualmie, Washington. Our breakfast there was amazing, full of flakey pastries, fresh fruit, perfect fried potatoes, and eggs, but when we were done eating, I couldn’t stop thinking about the oatmeal. The texture. The deliciousness. 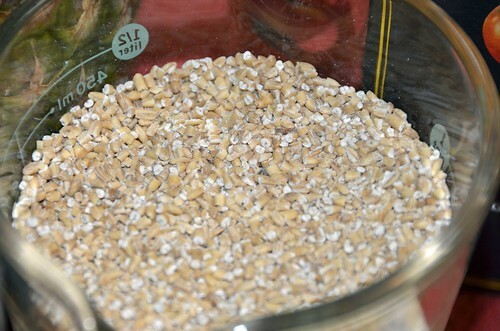 Steel-cut oats are whole oat groats that have been cut into pieces. Because they are minimally processed, they retain more of their nutritive value than rolled oats and when cooked into oatmeal, they are amazing. Cooking them is simple but it does take quite a while on the stovetop so I’ve recently started cooking mine overnight in the crockpot. Waking up to a hot breakfast, already prepared, is one of my favorite things, right under getting a great foot massage and sunshine. 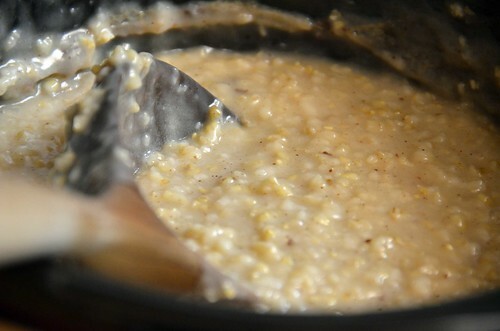 Start by measuring two cups of steel-cut oats into your crockpot. Next, add a teaspoon each of cinnamon and salt and stir to combine. 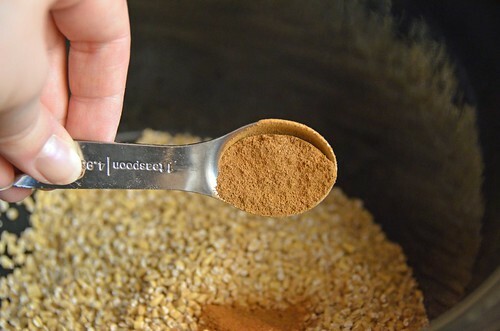 I like to add the dry ingredients before adding the water because then you have less chance of the cinnamon clumping up and over-flavoring one area of the oatmeal. Turn your slow cooker to low, cover and let it cook overnight. Eight hours is plenty but it can go longer if you need it to. In the morning, give the whole thing a good stir and serve with your favorite toppings. Personally I feel better when I load up on fruits and vegetables and limit my grains so I like to start with a cup of peaches, berries or other fruit and then stir in about half a cup of the oats. It also tastes great with a little fruit jam mixed in or topped with a sprinkling of brown sugar and raisons. 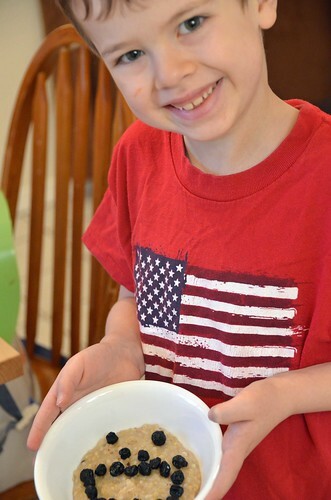 This morning, Magoo made a smiley face out of dried blueberries on his and Laylee brutally drowned hers with milk. Whatever floats your boat. If you have leftover oats, consider using them to make Heather’s recycled grain bread. It’s a winner. In the cut-and-paste recipe below, I’ve also listed alternate instructions for cooking the oats on the stovetop. 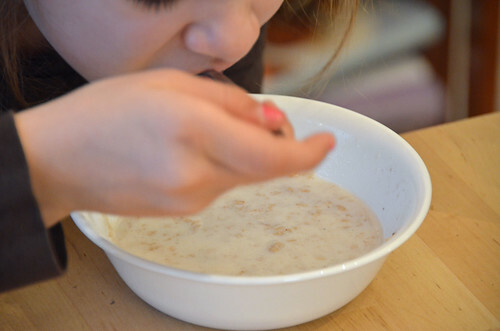 Combine oats, cinnamon, and salt in your crock pot. Pour in water and stir. Drop in butter. Cover. Turn crockpot to low and cook for 8-10 hours. Stir before serving. 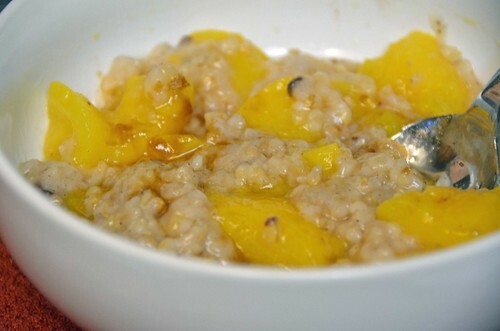 Oats can be served with your choice of fresh or dried fruit, brown sugar, fruit jam, or milk. 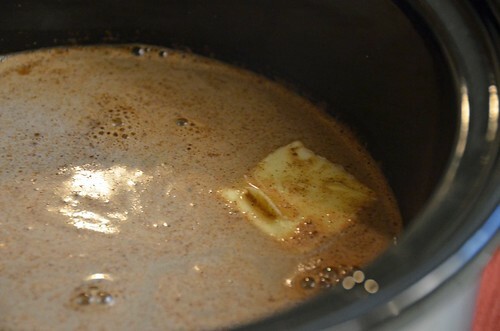 Alternately – you can combine the ingredients on the stove top and bring to a boil over medium-high heat. Then turn the heat to low and simmer for 30 minutes or more, stirring the bottom frequently until the oats reach the desired consistency. 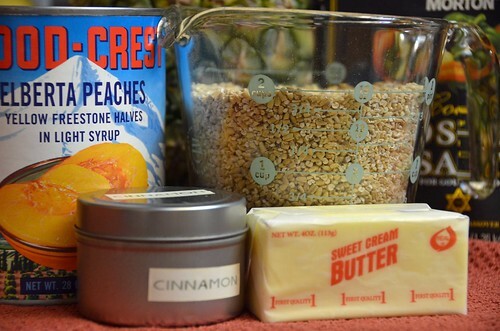 You can also soak the oats in the water over night and then add the other ingredients and cook them on the stovetop as listed above but the cooking time should go down to between five and ten minutes. I posted this on Pinterest forever ago and finally tried it today so my husband could wake up with warm oats before his marathon race. It was perfect and delicious! We will be doing it again. Thank you! Awesome, Marissa. So glad you enjoyed them. I had steel cut oats for breakfast, today. Delicious.